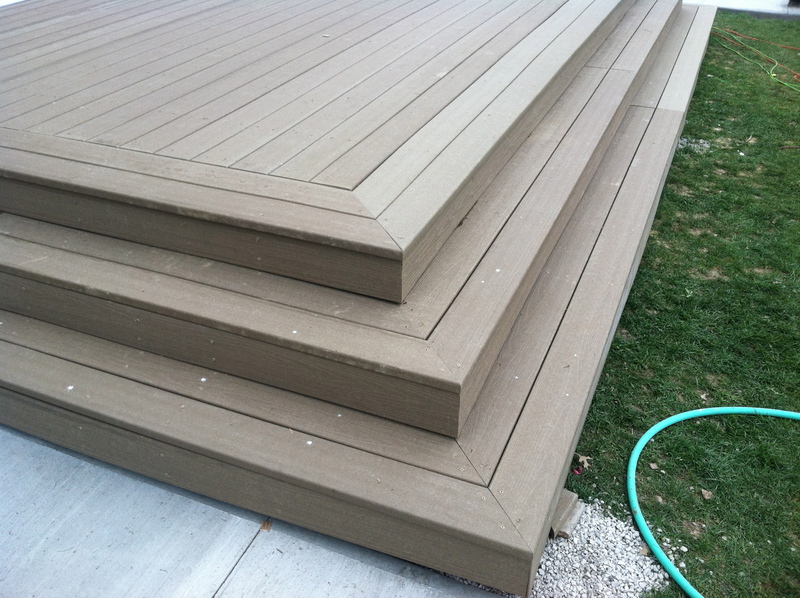 My home was built in 2004 but my deck looked like it was built in 1990. We bought the house in 2007 and the previous owners built a small deck on the back of the house from OLD composite decking. It was flaking, faded and very molded. 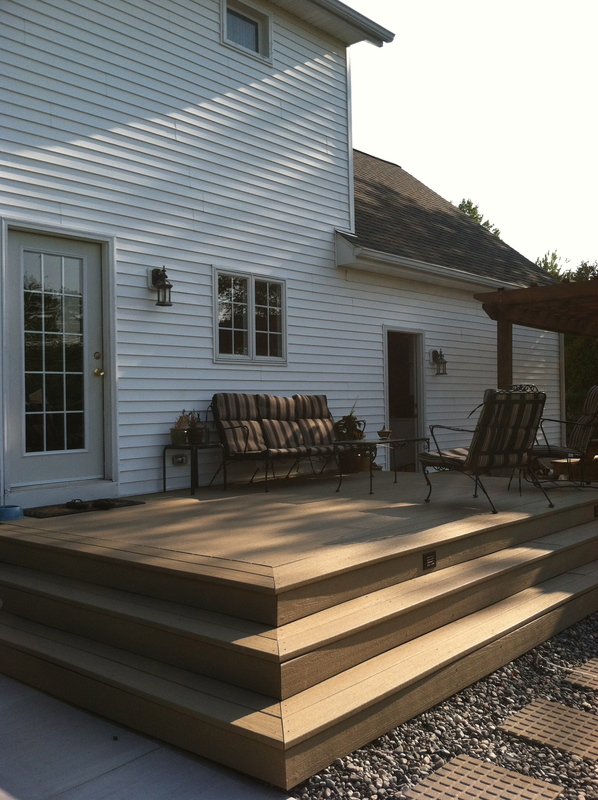 When my husband would try to spray off the decking, it would just disintegrate. 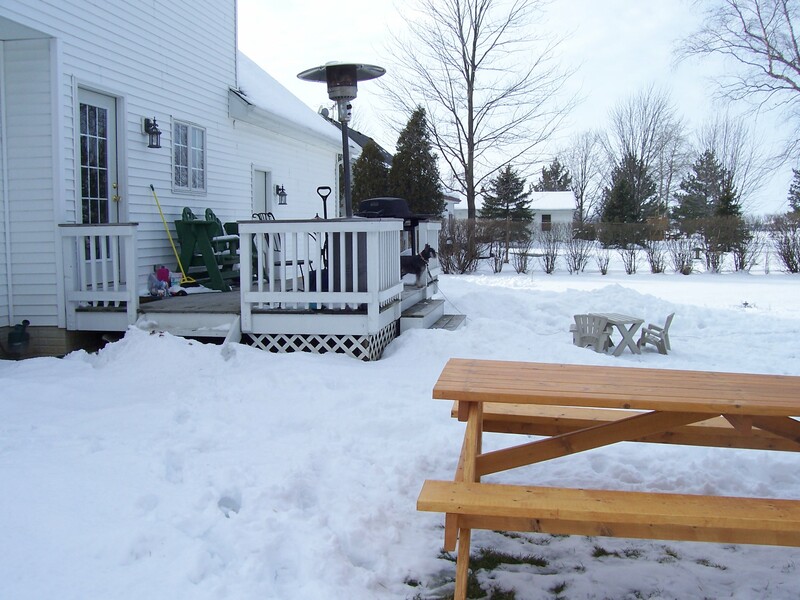 The deck also had railings going around most of it, so when you were sitting on the deck you couldn’t see anything. This bothered me a lot because we had a beautiful view in the summer. It was painted white but had to be repainted a couple of times a year, the paint did not want to stick. 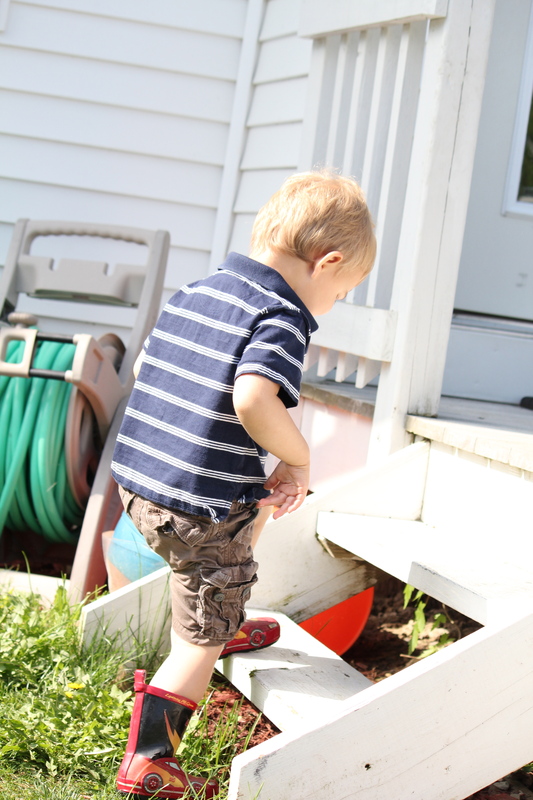 I love this picture of my son in his rubber boots. You would never know by looking at this picture how dangerous that step was. I think everyone in my house and all of my neighbors had almost killed themselves slipping down that step. 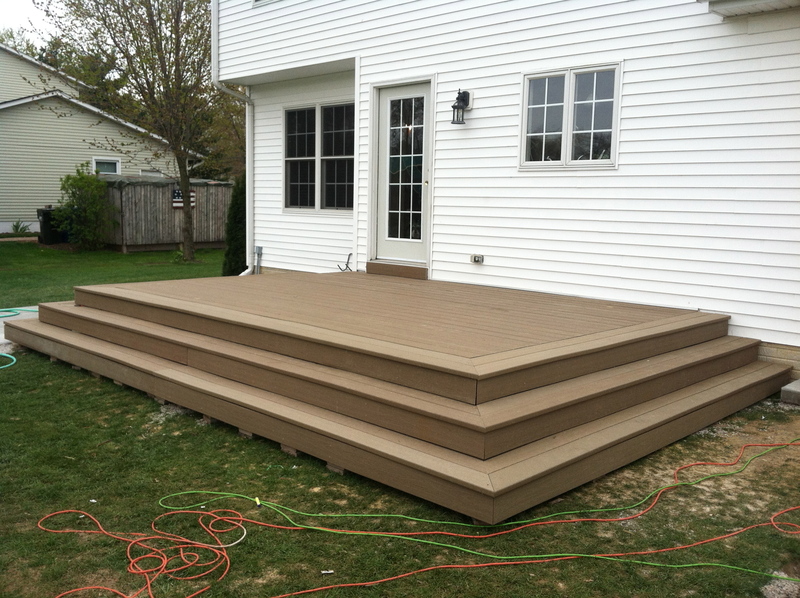 These are just a few of the many reason why this deck had to go. 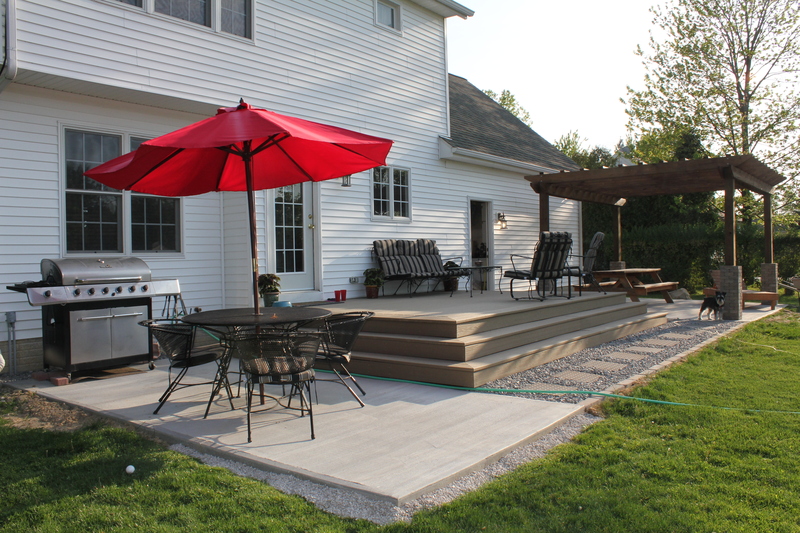 We started by looking into building onto the deck or maybe going further out or wider. 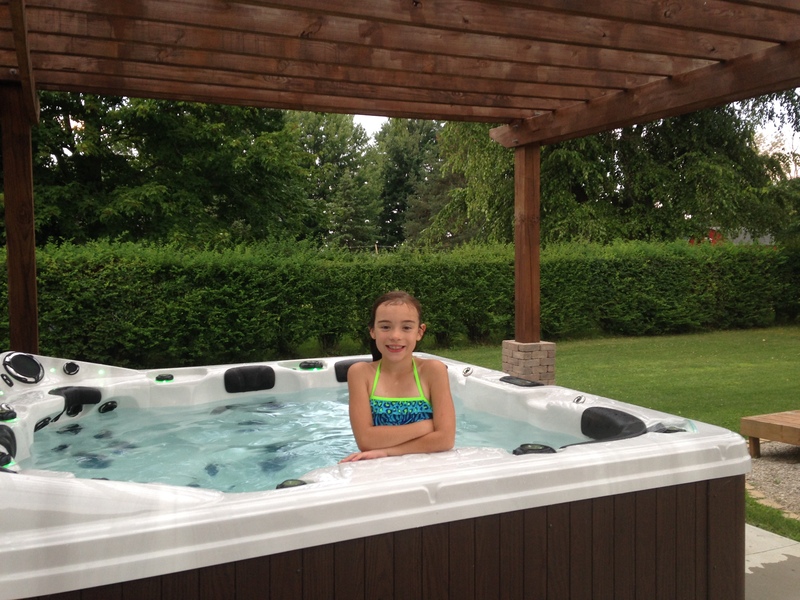 I got a few price quotes and they wanted $15,000…no thank you! 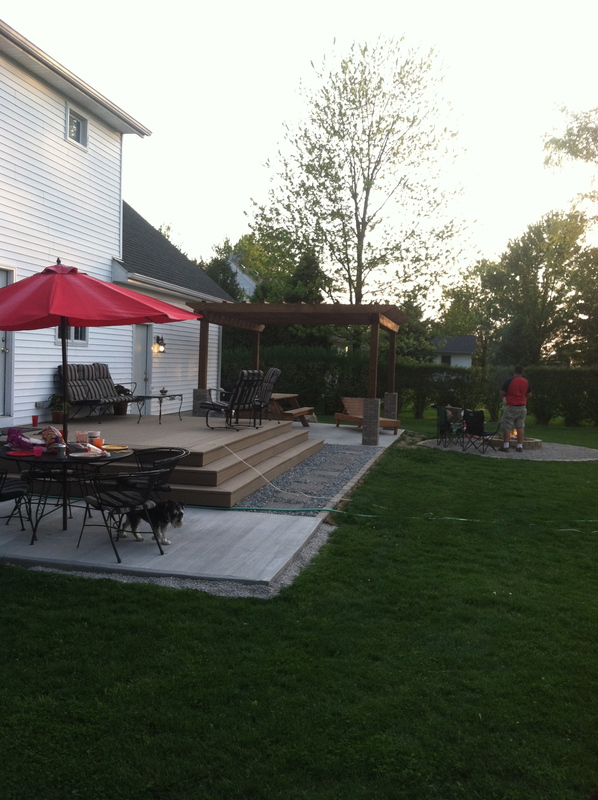 Then I began looking into building a paver patio and walkway around the existing deck, quote was $30,000. At this point I was just overwhelmed with the cost that I about gave up on the whole thing. 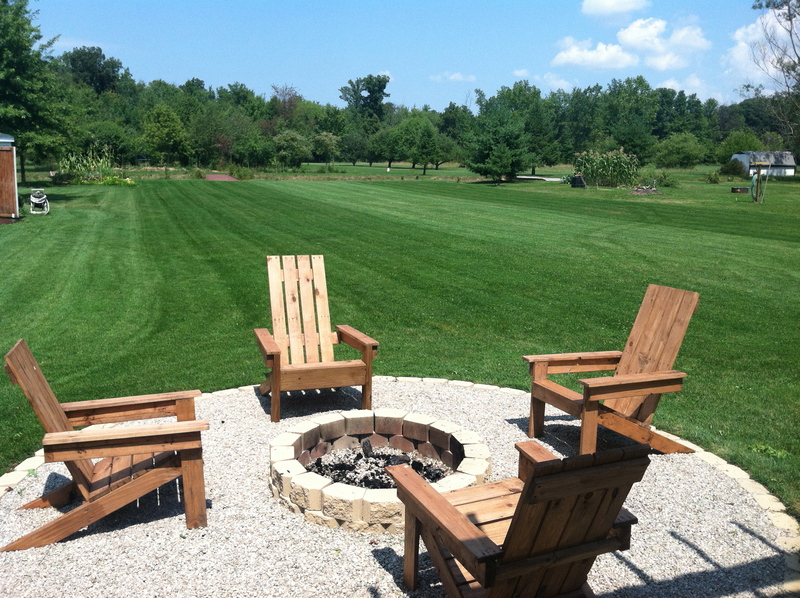 My husband and I did all of our own landscaping when we lived in Arizona and I knew the only way we were going to be able to afford this project was if we did it ourselves. 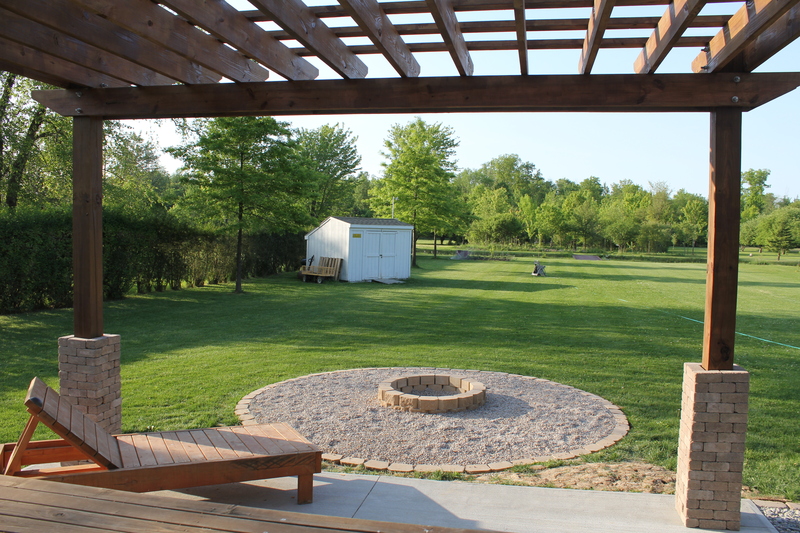 I set a budget of $5000 and started designing my affordable dream back yard. I drew several blue prints and watched a few deck building videos on YouTube. I was able to price everything down to the screws and brackets by going online at lowes.com. 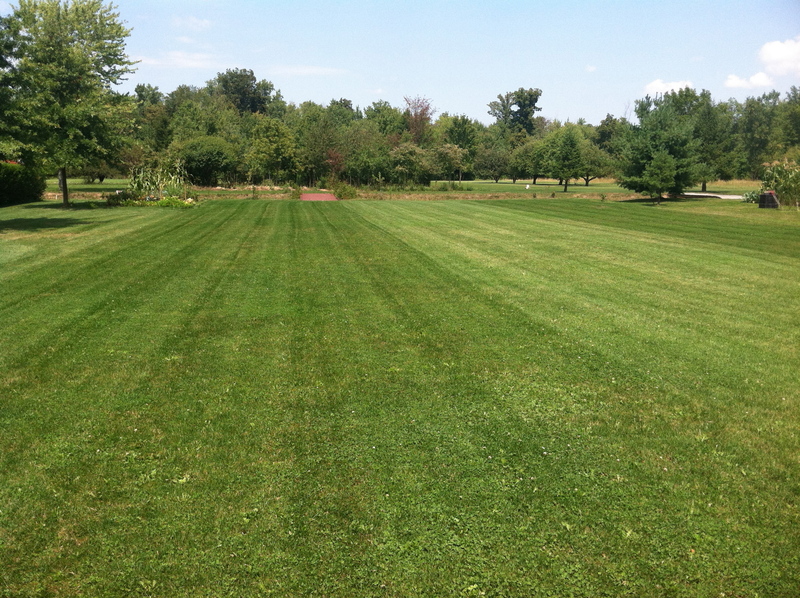 I couldn’t believe that it was actually possible to get my dream back yard for under $5000 dollars. 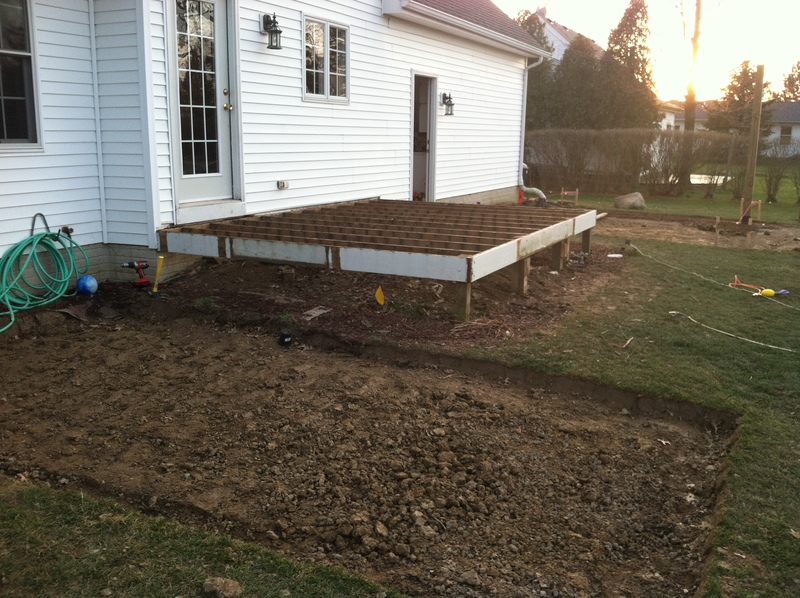 After demoing the old deck we started getting the ground ready for the concrete pads. 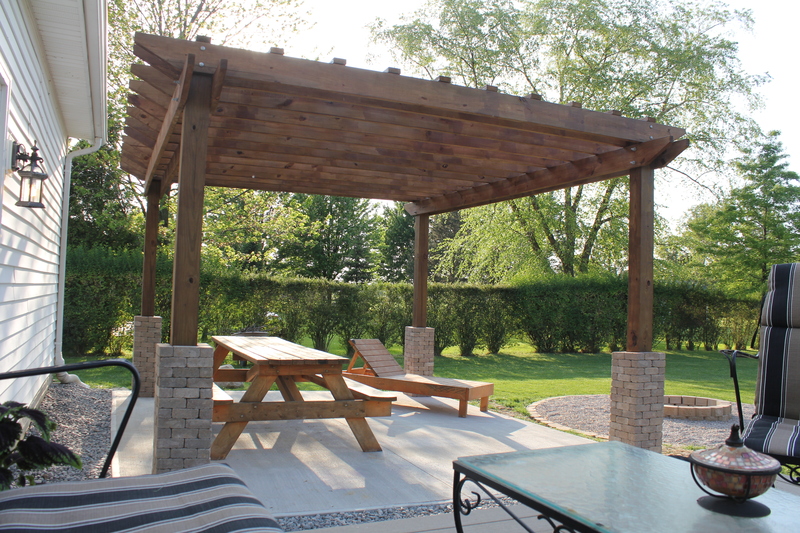 We had to do a lot of measuring for the pergola post to make sure they would be square. 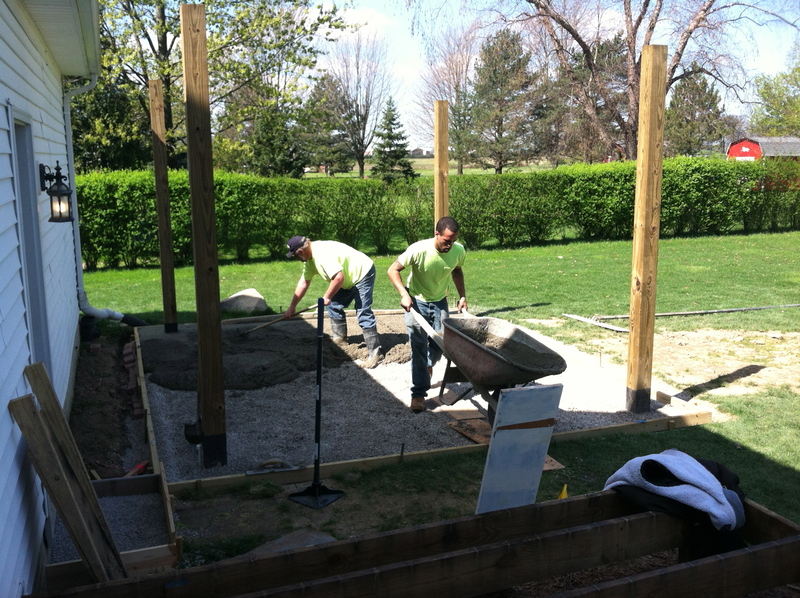 We had to concrete the pergola post in the ground before the concrete pads could be poured. 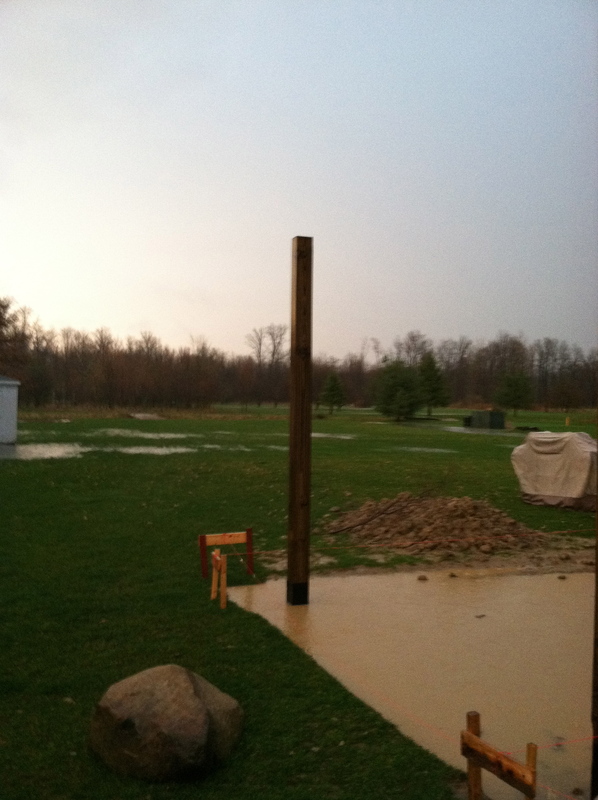 Luckily the post were set in concrete and it had dried before we got hit with a big rain storm. 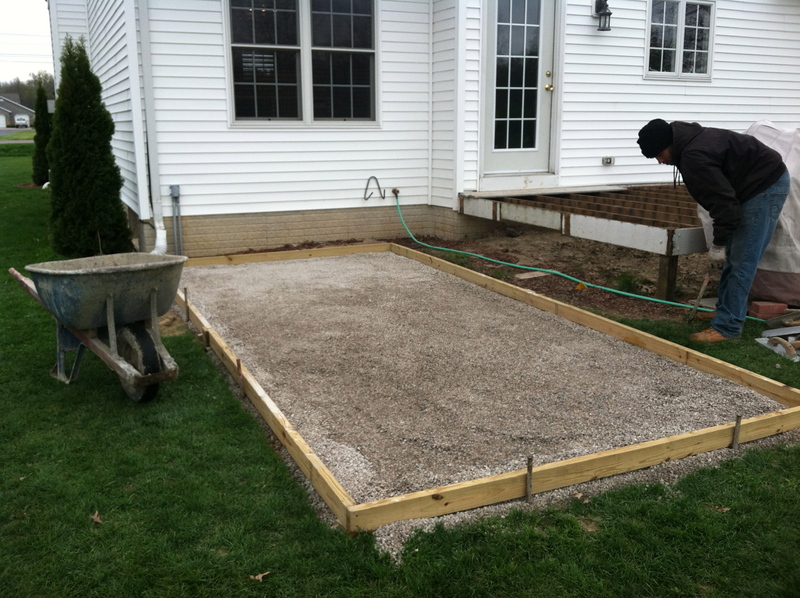 Once things dried up a little we framed out our pads and laid a 4″ layer of ground granite. 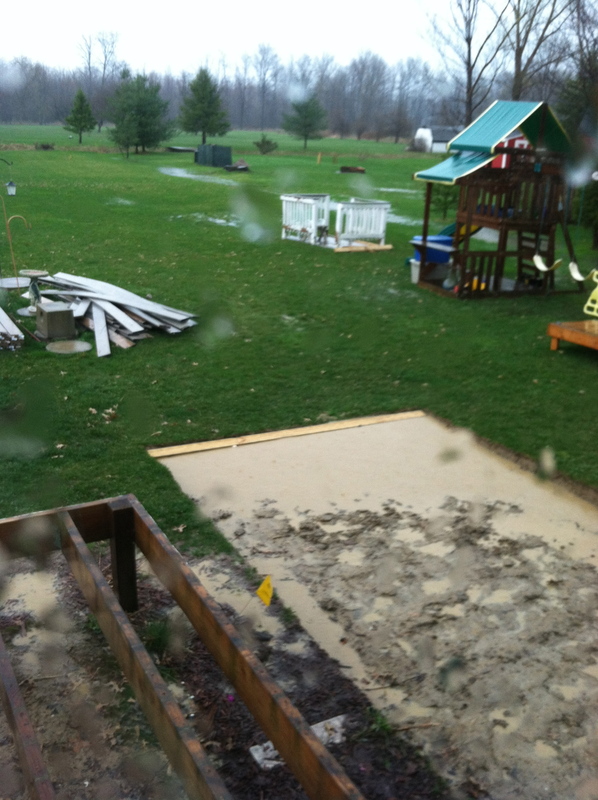 We were now ready for our concrete!! 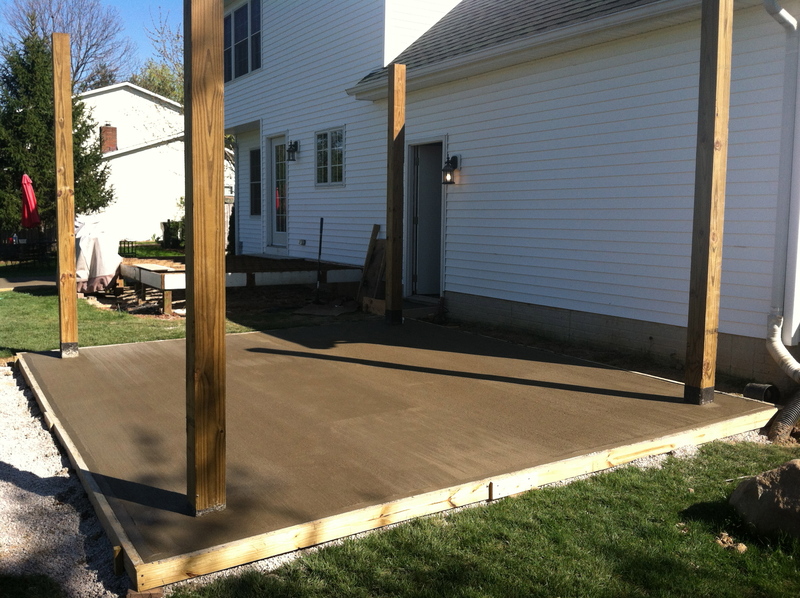 Once the concrete had dried we were ready to starting working on the deck again. 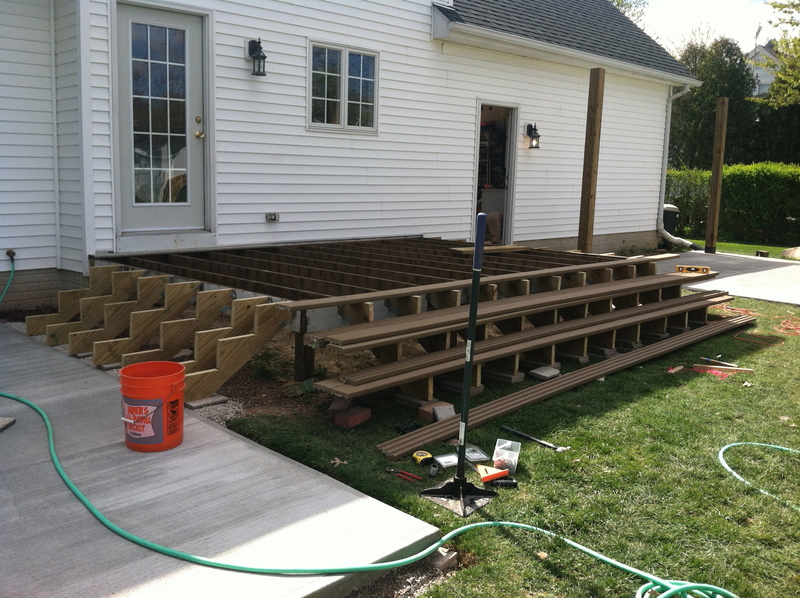 We decided since our deck did not sit very high off the ground that we were safe leaving the railings off and just wrapping the stairs all the way around it. 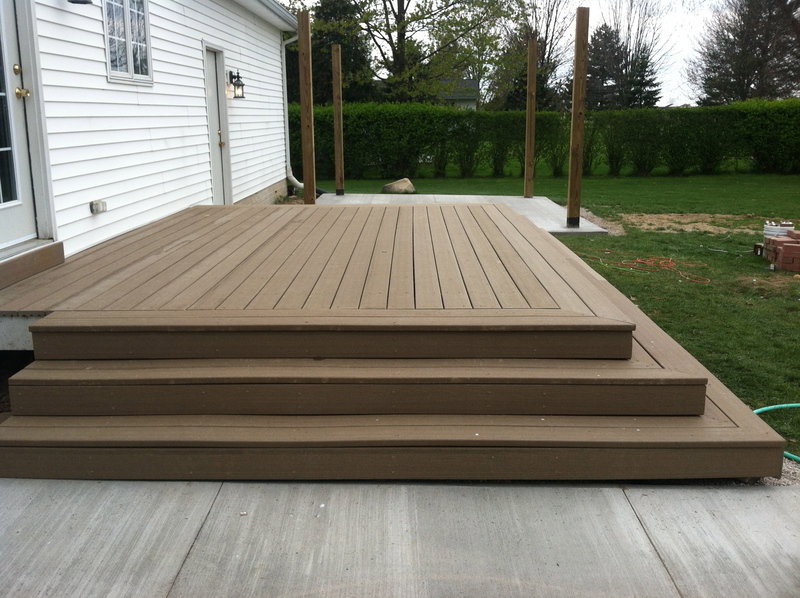 We used over 30, 3 step stringers. To keep costs down we bought one 3 step stringer and used it as a stencil to make our own. We attached them all with metal brackets that my husband found on eBay for half the of the hardware store. 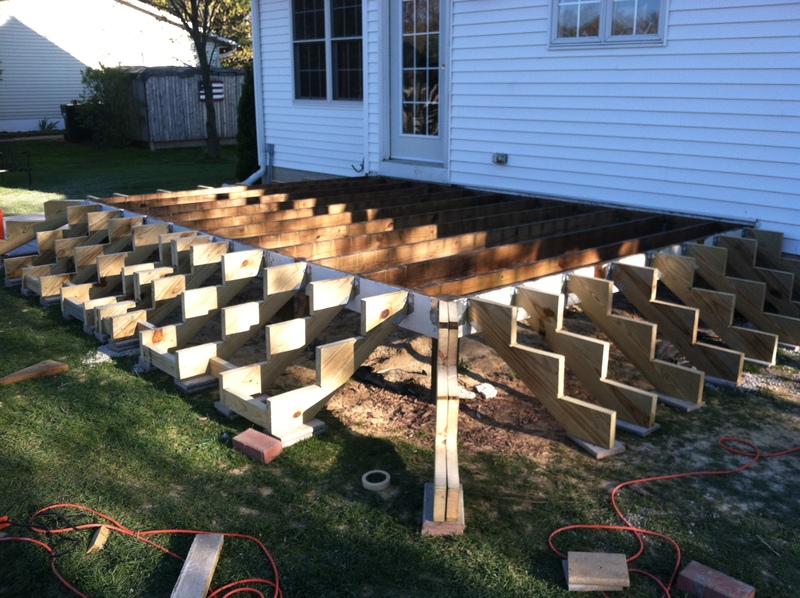 Next, we placed a piece of old composite decking under each stringer, so that they were level with each other and they would not sink in the ground when stepped on. 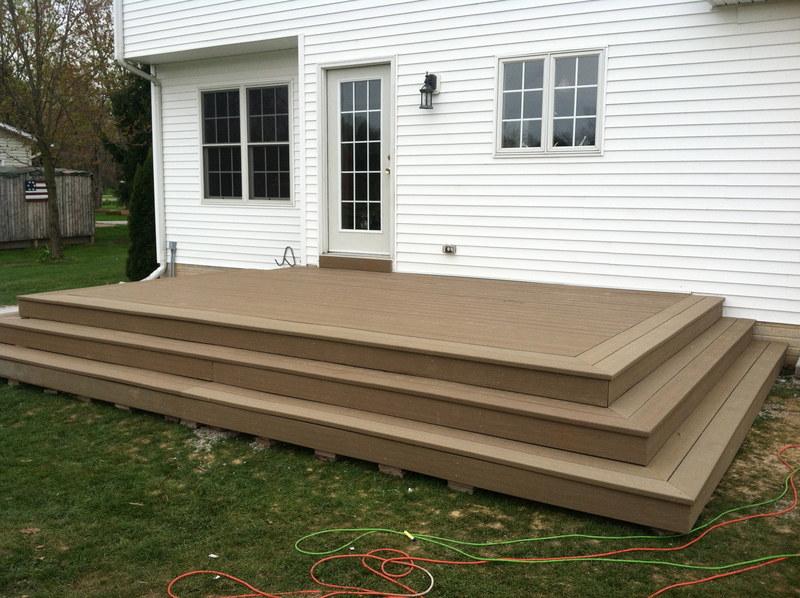 We started this project in February so we found a great deal on clearance composite decking at Lowe’s. 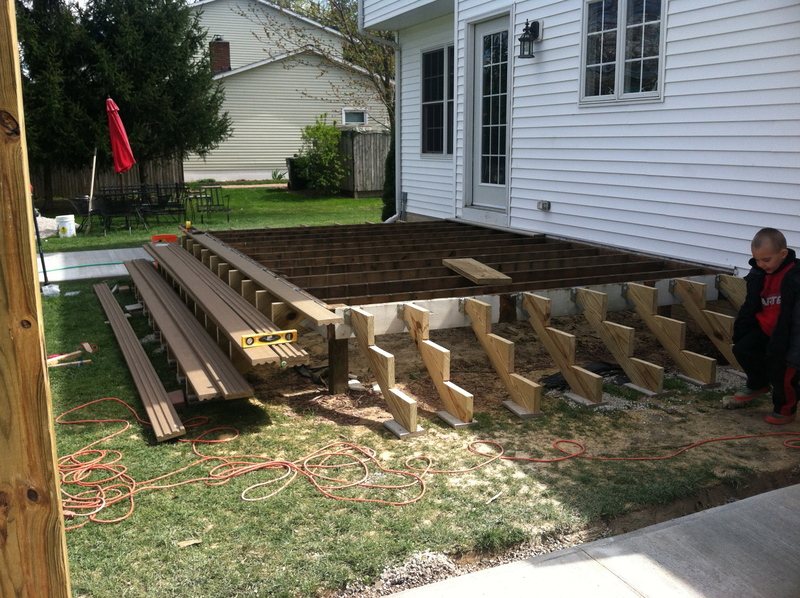 Laying the decking boards out first help us visualize our layout. 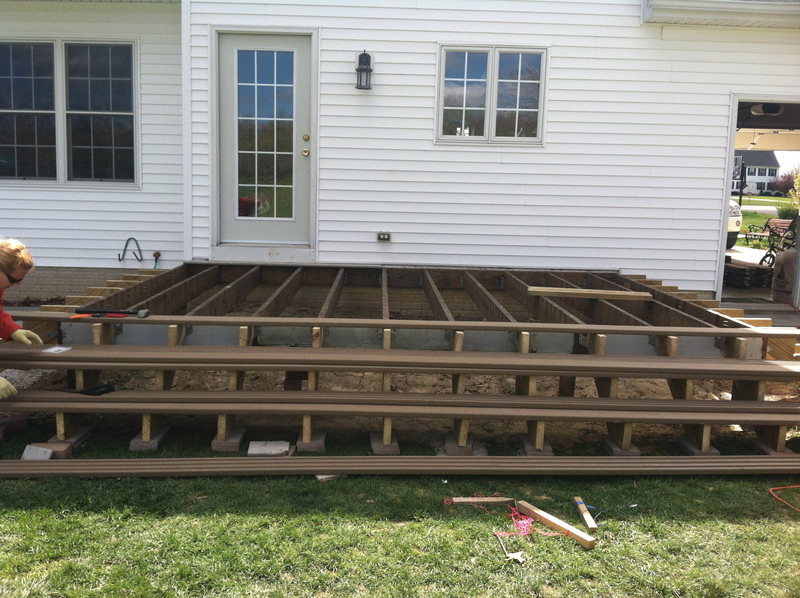 Thousands of deck screws and a very tired husband later, the deck was done 🙂 Yay!! It looks so much bigger with the railings gone. We added LED step lighting. 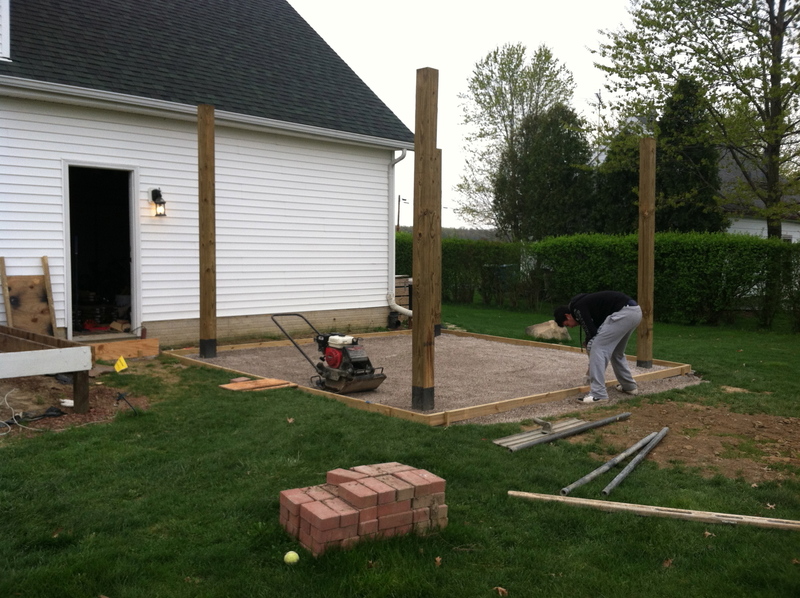 It was now time to start on the pergola. I designed it myself and am very happy with the way it turned out. 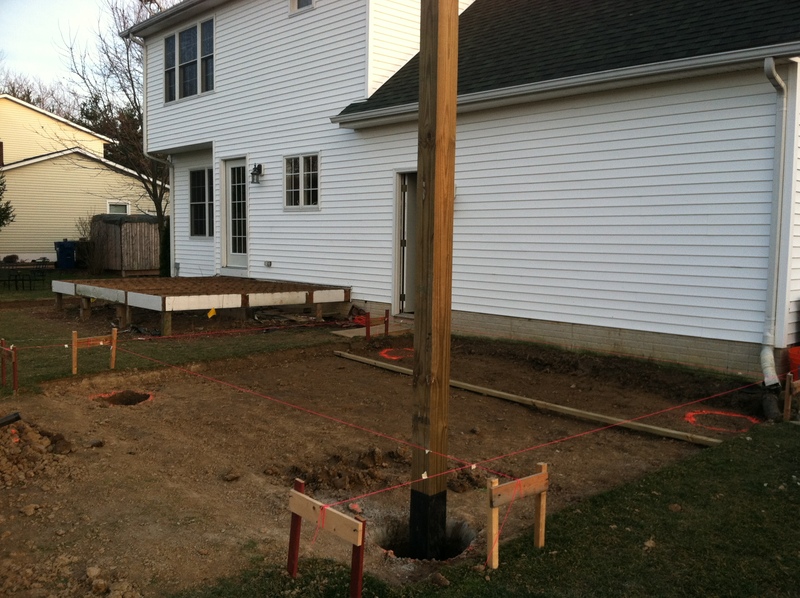 I used 6″ x 6″ post and 2″ x 8″ x 14′ supports. It is very solid and is not going anywhere any time soon. 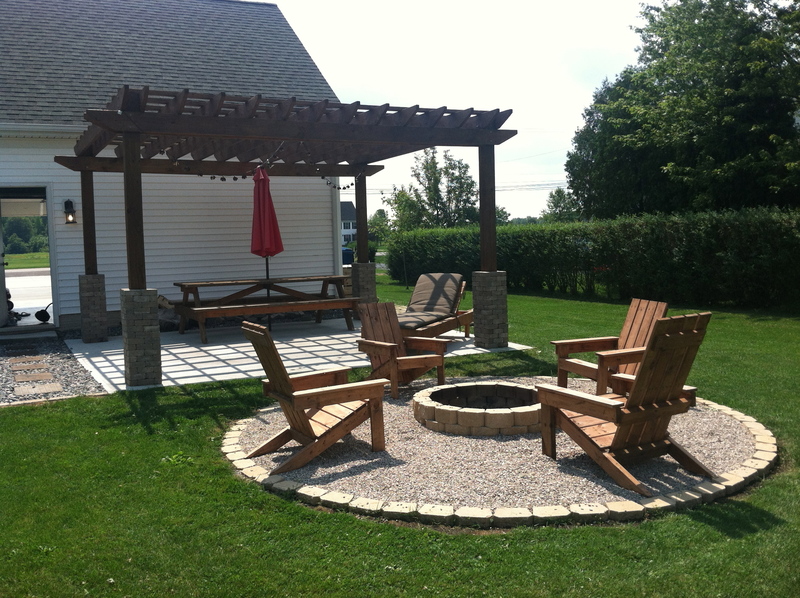 It wasn’t part of the original plan but we decided to add a fire pit area. 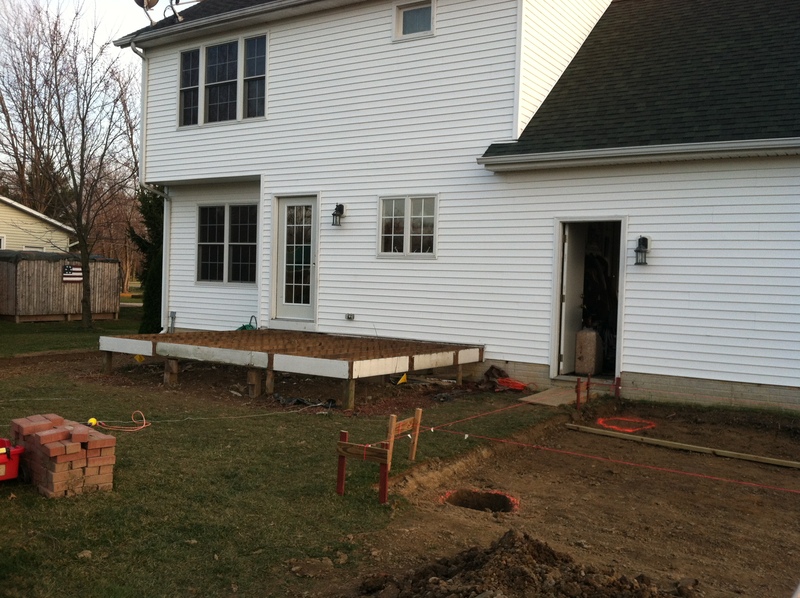 This is where we had thrown all of the grass that we excavated for the concrete pads. We used left over gravel and all the pavers were under $50. Well I LOVE how it turned out and I am loving my view from my new deck. 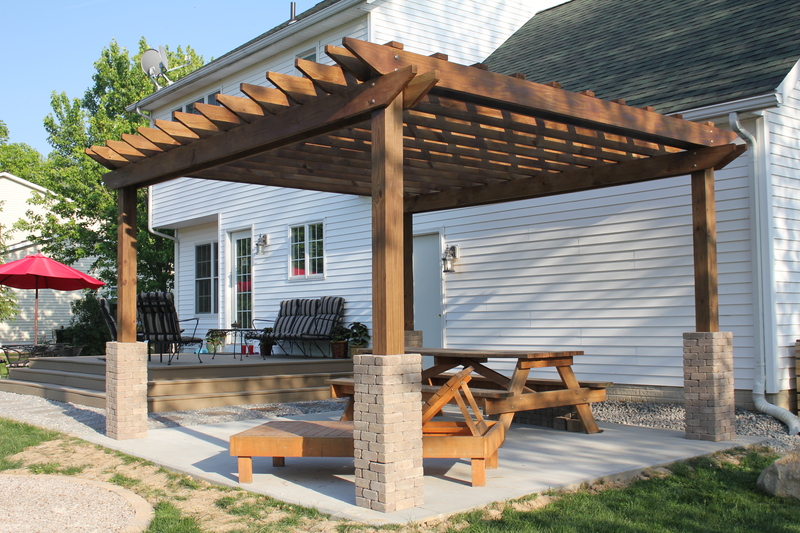 Your patio and turned out awesome! It would be great to see some photos of the LED lights at night. I’m curious how many you added into the stairs, spacing, etc. Did you just plug them into an outdoor wall outlet? Thanks Kevin, I’m glad you asked about the lighting. That was another step in the transformation that I forgot to mention but it was a big part of it. 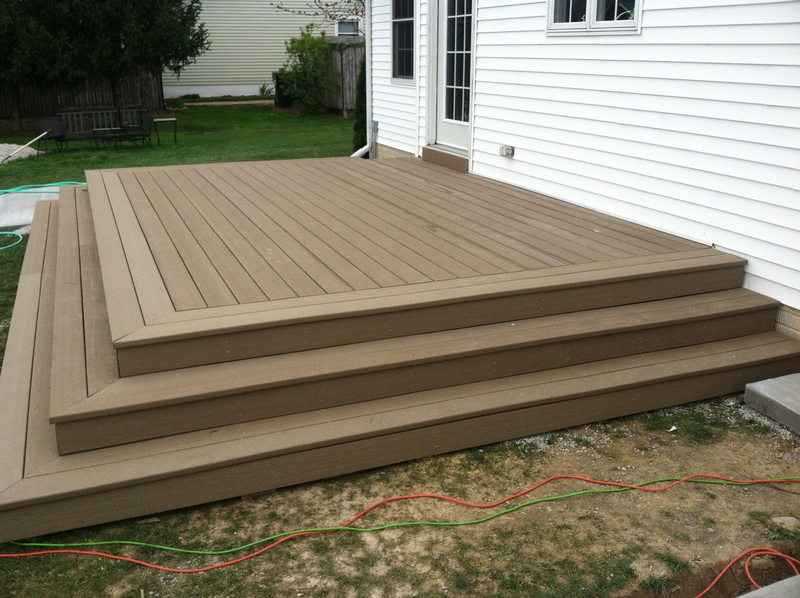 We actually ran low voltage cables on the second step of the deck, behind the composite decking, all the way around. 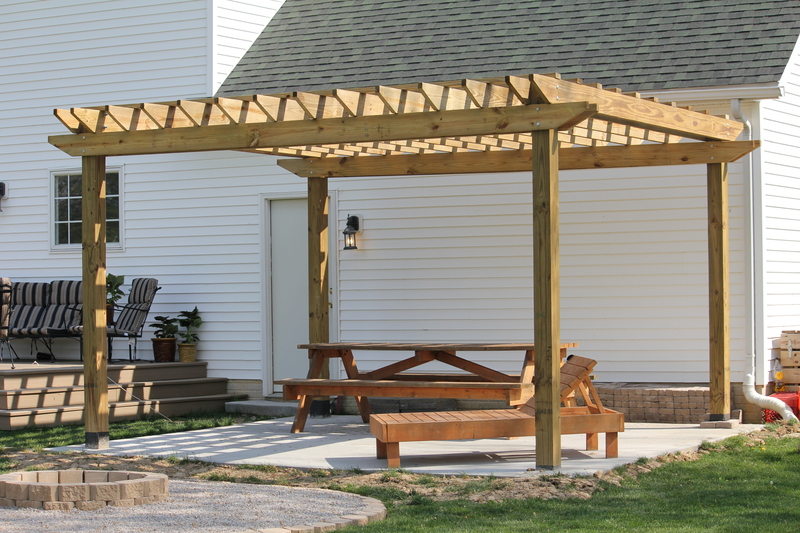 It continued under the walkway and up the side of the pergola. 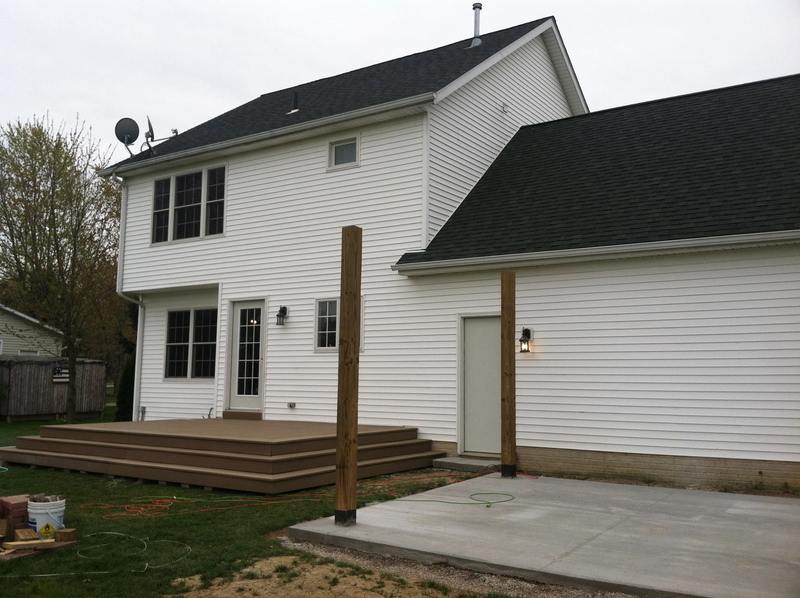 Visit my blog next week for more info and photos of the lighting steps.